Home > all > Tech > Health experts excited by the potential of "Transformational Technology"
Health experts excited by the potential of "Transformational Technology"
The event coincided with APEC Health Security Week and was the fourth iteration in the series, which has offered unprecedented public access to local and visiting experts on APEC topics – including economic integration agriculture and health. 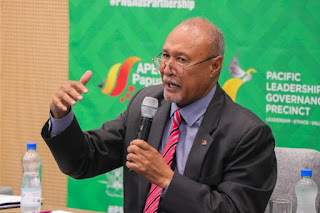 The conversation was centred on primary health care and the panellists were quick to highlight the relevance of the 2018 APEC theme – ‘Harnessing Inclusive Opportunities, Embracing the Digital Future’ – to health in Papua New Guinea. “Heath is not an expenditure item – it is an investment item. We invest in the health of the nation,” he said. The APEC Discussion Series is hosted by the PNG APEC Secretariat and the Pacific Leadership and Governance Precinct. The APEC Series continues on 5 September with an event themed: ‘Women in Leadership’.